In zero hour talks Yishai makes an odd offer retracting his initial rejection, which may still see the parties get past threshold together. As talks to form a joint list reach the zero hour ahead of a Thursday deadline to submit Knesset lists, MK Eli Yishai's Yachad - Ha'am Itanu party has made an odd offer, retracting its original position regarding spots on a joint list with former MK Dr. Michael Ben-Ari's Otzma Yehudit. According to reports, contacts between the two parties are set to end in a few hours on Tuesday night, and the two are anticipated to run on a technical bloc joint list by which they would likely split after elections, with Yishai joining a Likud-led coalition while Otzma Yehudit would be in the opposition. The two parties reached an impasse in talks on Monday, when Yishai's party reportedly refused Otzma Yehudit's request for the fourth and sixth spots on the joint list as opposed to just the sixth. Arutz Sheva has learned that Yishai has now relented and proposed to give the fourth spot on the list to Otzma Yehudit - but instead of reserving it for Ben-Ari, he is offering it to nationalist activist Baruch Marzel from Hevron, who is fourth on Otzma Yehudit's released list. As to why Yishai proposed giving the seat to Marzel instead of to Ben-Ari, who has previously served as a Member of Knesset, remains unclear. Ben-Ari, Marzel, and the two other leading figures of the party - Attorney Itamar Ben-Gvir and anti-assimilation organization Lehava director Bentzi Gopshtain - are expected to hold an emergency meeting on Tuesday night to decide whether or not to accept the proposal. According to Otzma Yehudit sources, an MK close to Yishai previously had "torpedoed" the talks by, among other things, saying there was "no room" in the top four spots for Ben-Ari. Yoni Chetboun - formerly of the Jewish Home party - is the only other currently-serving MK on Ha'am Itanu's list. Polls have shown both parties are liable not to pass the threshold that was raised by the outgoing government if running separately, but together would comfortably enter with seven seats. That being the case, it is possible that both Marzel and Ben-Ari would enter even with Yishai's proposal. Rabbi Yisrael Ariel, director of the Temple Institute, condemned Yishai's decision not to give Ben-Ari the fourth spot on Tuesday, telling Arutz Sheva "everyone knows that Eli Yishai isn't succeeding in getting together his public that is still with Shas...on the other hand, Ben-Ari had 67,000 people that voted for him (in the last elections)." Ben-Ari is "succeeding in recruiting tens of thousands, so to tell a man like this to be in the sixth or seventh spot is not right," said Rabbi Ariel. 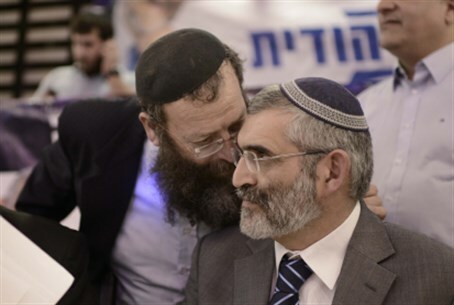 "There is simple egoism and pettiness here, if (Yishai's party) doesn't get back its composure in the last minute and give a place for all the masses waiting for this unity between Eli Yishai and Ben-Ari, it will be a true danger to all of us," warned the rabbi.